I have a major snacking and munching addiction. Come 5 PM, and I’m always reaching out for something – unhealthy mostly. Just between you and me, I think it’s a family thing. My dad is exactly the same and has to munch on something once he gets back home. Masala chickpeas or chanas are his favorite snack! And this experiment started as a way to make his favorite snack healthier. Presenting to you Crunchy Roasted Indian Masala Chickpeas. Actually today is not just about the chickpeas. It’s also our anniversary and sadly enough, Denver and I are in two different cities. I’m in Raipur and he’s in Bangalore. But luckily enough, we have 3 anniversaries every year for the 3 weddings we had and our celebrations usually last a week. It’s a long story and we’ll need to meet over chai and roasted masala chickpeas to talk about it, but all you need to know is that we’ll be together on Friday and I can’t wait! 3 years is a long time to be married, and 7 years is an even longer time to be together. But the butterflies in my stomach never stop, and the smiles when we see each other just seem to get broader. Sigh. Being married is so amazing! I didn’t mean for this post to turn into a mushy declaration of love, but I can’t stop getting EMO when it comes to Denver! Getting back to this super addictive snack, I followed the easy instructions from The Kitchn but ended up modifying them slightly to make these super crunchy, just the way my dad likes them! In fact I plan to present these to him when he gets back home today. Let’s see if it passes the test. I’ll keep you guys posted! 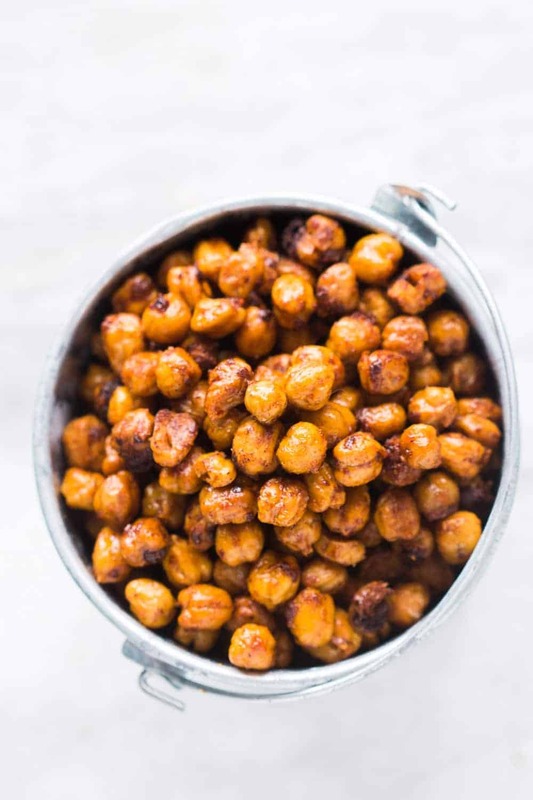 An easy foolproof recipe for roasted chickpeas flavored with Indian Masala. 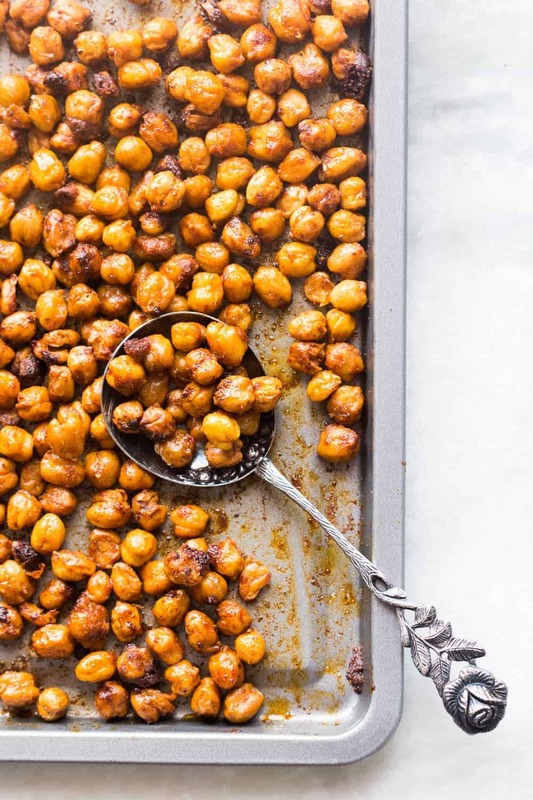 This recipe is sure shot way to get super crunchy chickpeas or chanas. Drain water completely from the chickpeas and dry them using a kitchen towel. I like to place them in a single layer between two kitchen towels to get rid of as much water as possible and then leave them outside for half an hour or so. Pre-heat oven to 200 degrees or 400 degree Fahrenheit. Lay them on a roasting tray in a single layer and drizzle with 2 tablespoons Olive Oil and sprinkle with salt. Mix well. Let them roast in the oven for 30-40 minutes and keep stirring them every fifteen minutes or so. Reduce the oven temperature to 175 degrees at the 30 minute mark. After 35-40 minutes, remove them from the oven and sprinkle with all the other spices and remaining olive oil. Toss well and put the tray back in the oven for 3-4 minutes. Any longer will burn the spices so be careful at this stage. Let them cool completely before storing them in an airtight container. 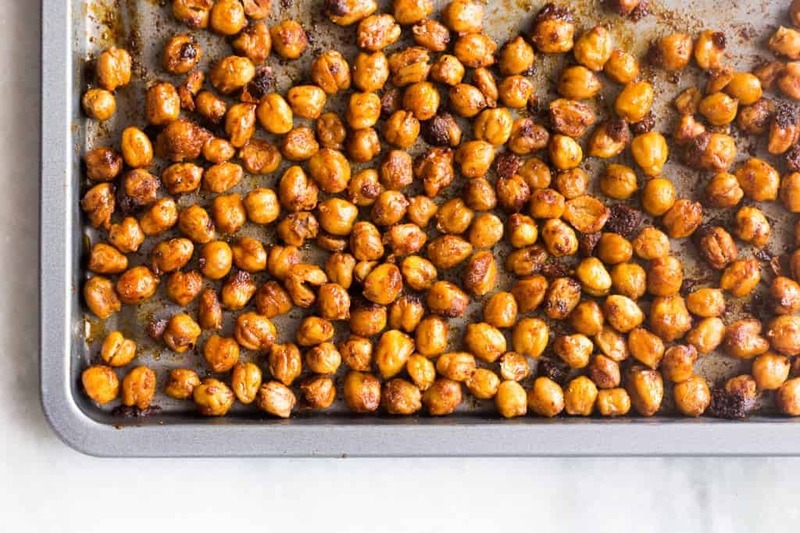 The chickpeas stay crisp and crunchy for up to a week. Note 1: If using canned chickpeas, drain completely. Feel free to use your own spice blend. I love using honey and mustard oil for a honey mustard blend too. The nutritional information below is for 6 servings. Excellent — such a tasty snack! I was trying to create something similar to snack packet every vendor sells for a few rupies called Chana Fataka by Haldirams. I’m very pleased with this recipe. Rather than regular chana, I tried green chana, which was sitting on the shelf. It never seems to cook up as much as regular chana, so I had a hunch it might due well for being a crispy treat, and it did. I see your anniversary is almost hear, so wishing you the best! And thanks for keeping the recipe posted. Thanks so much Dayle! ‘ve never tried Chana Fataka but from the name it sounds delicious! Just came out of the oven today, and the spice flavor is amazing… but maybe it’s the humidity here in Indiana, or maybe it’s my oven, but they’re nowhere close to crunchy. I think they’ll still make good munchies for my book event on Sunday, but it’s not quite what I was expecting. Hey Allene, this happens sometimes because all ovens are slightly different. 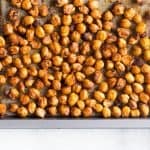 The idea is to dehydrate the chickpeas, so if they are not crunchy enough, you can try reducing the oven temperature to 150C and bake them for an additional 15-20 minutes till they become nice and crunchy! I’m making this right now and I am using dried chickpeas. I cooked them in the pressure cooker and I’m thinking they might be too soft because you can smoosh them. How long would you cook them in the pressure cooker so they remain crunchy? Hey Colleen! They should take at least a half hour to forty minutes if you haven’t soaked them before. If they are pre-soaked, I’d say about 15 minutes. Happy Anniversary and loving those crystal clear and sharp pictures. Your style always mesmerize me darling!